In this week’s Reflections on the BSA video, view a special pull from the archives with an interview of Walter Gropius in “Invitation to Art” with Brian O’Doherty from The Museum of Fine Arts Boston. 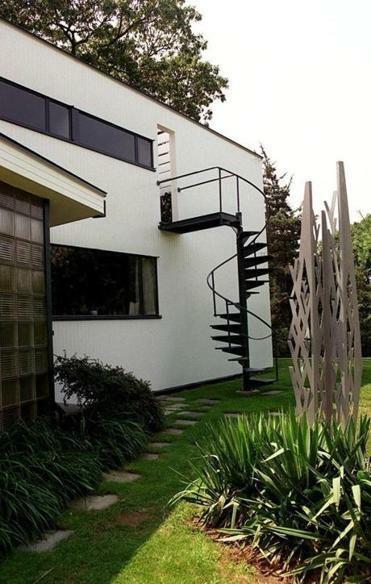 He founded the Bauhaus and an influential Cambridge firm. But his greatest unfinished project would have reshaped Baghdad. 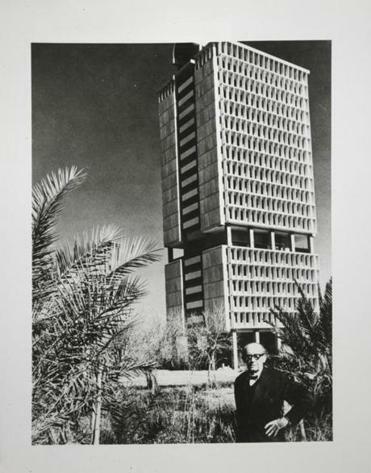 A MAN, A PLAN: Walter Gropius in front of his Baghdad faculty tower. ONE OF IRAQ’S richest resources—its history—has been under attack in recent weeks, as the Sunni extremist group ISIS has been blowing up Shia mosques, Christian sites, and other ancient shrines to advance its fundamentalist vision of the future. The purported Biblical tomb of Jonah was a recent casualty. These depressing acts of destruction can be seen on video, as the militants combine high-tech capability with their desire to take Iraq back, if not quite to the Stone Age, then to somewhere comfortably pre-modern. Not too many years ago, within living memory, Iraq stood for the exact opposite idea. Its history was an uncontested point of pride—and even more significantly, Baghdad was in the vanguard of a movement to build a better post-war world. Like Brasilia and other dream cities, in the 1950s it tried to become a place where a better future might be glimpsed—a place of hope, daring, and possibility. Accordingly, it became, for a few years, a site of fascination for the world’s leading architects, including one right here in Boston. Under the leadership of a young and moderate king, Faisal II, Iraq was moving forward boldly in the 1950s, shedding all vestiges of British colonialism, channeling oil revenues into development projects, and inviting the world’s most ambitious designers to write the country’s next chapter. That meant a new look for its capital. Baghdad would be a place where one could dare to dream big, and all the avatars of Modernism answered the call. The iconic French brutalist Le Corbusier designed a huge sports complex, with a metal roof based on his idea of a tent in Eden (it was later built as the Saddam Hussein Sports Complex). Frank Lloyd Wright was poised to get the opera house. Jose Luis Sert, Gio Ponti, and Alvar Aalto had other pieces of the pie. He did that brilliantly in his own, war-ravaged country. He would do it again in New England. But these were just modest precursors to what was supposed to be his grand achievement. Gropius’s design for the University of Baghdad, crafted at the height of his global reputation, was his longest commission and in many ways his most ambitious project, one intended to shape not just a campus but a culture. But as it turned out, no utopian vision, not even that of the master designer, was quite up to the challenge of reinventing the Middle East. IN MARCH 1937, Walter Gropius had arrived in Boston, having fled to England during the rise of the Nazis, before accepting an invitation from Harvard to teach in its design school. In New England he found a surprisingly fertile soil for his idealistic vision. The Gropius House in the Lincoln woods. He soon moved out to Lincoln, where he designed a home that still stands, as a stubborn monument to light in a world turning dark—its large and ample windows opening onto the woods, its white surfaces promising a climate of better thoughts and actions. The firm he founded in Cambridge, The Architects Collaborative, was in many ways the heir to the Bauhaus tradition and its teachings. From its headquarters just outside of Harvard Square, at 63 Brattle St., TAC dispensed a seemingly limitless supply of hopeful architectural statements about the world. Gropius and his team sprinkled modernist cubes into New England’s leafy landscapes—a junior high school in Attleboro, Wayland High School, homes in Framingham, Sudbury, Belmont, and Cohasset, more schools in Needham and Littleton. To a remarkable degree, Gropius brought his revolutionary design sensibility into ordinary and sheltered places, such as the institutions of small towns in suburban Boston. Thousands of local children may have been educated in TAC buildings without knowing that their long one-story school, with all of its glassy surfaces, was in its way a reaction to the darkness of World War I, and to the vertical, classicist heritage that had been discredited by the slaughter. When not haggling over designs with local school committees, Gropius was teaching at Harvard, bringing the Bauhaus ideas to ever-new audiences. In 1943 he met a design student from Iraq, Nizar Ali Jawdat, whose father became prime minister in 1957, at the height of Iraq’s openness to the world. Like modern architecture, Iraq itself was something of a legacy of the First World War, cobbled together by post-war planners. Gropius had been fascinated by the Middle East since his childhood, when a Berlin-to-Baghdad railway had been contemplated to bring the Middle East more under German sway. In 1954 he visited Baghdad on his way home from a trip to Japan, and at a cocktail party met a group of local intellectuals, talking idealistically about creating an ambitious University of Baghdad that would accelerate Iraq’s progress. Gropius and his team set to work designing a massive complex for 12,000 students. The work was “progressing nicely,” in the words of a team member, Louis McMillen, when the TAC architects read in the papers that Iraq’s progressive young king had been assassinated in a coup on July 14, 1958. The team pressed on, hopeful that the coup leader, General Abd al-Karim Qasim, would want to complete the project. Early meetings with their new patron confirmed that he did, but when the Cambridge architects went to see the general, they found him surrounded by machine-gun-toting guards (as McMillen wrote, “all this made for rather formal meetings”). That made optimism a bit more challenging, but the work went forward. Qasim laid the cornerstone in 1963, and some building began. One of the few pieces of his master plan that was built; the Open Mind arch. The team had come up with a plan that radiated idealism—a tasteful merging of Arab motifs with the most modern technology, and considerable attention to the problem of getting Iraq’s different people into a common space to talk to one another. All of the knowledge he had gained building high schools and junior high schools in Massachusetts went into the project of a lifetime. Gropius devoted enormous time to the challenge of the site, and in particular to its heat, an unfamiliar environmental problem for the German New Englander. He lined the approaches with hundreds of date and eucalyptus trees. He set the buildings asymmetrically, for maximal shading. He built innovative sun screens. He draped mats of camel thorn in the windows, following Middle Eastern custom. He included courtyards and reflecting pools and fountains; he put sprinklers on roofs. He also indulged the sensibilities of the West, adding a shopping center, swimming pools, carports, a clock tower, and air conditioning throughout. Yet this was no simple transplant of American ideas. Gropius wanted his buildings to fit with their setting, and with his optimistic view of human nature. His courtyards and student lounges were specifically designed to foster tolerance and conversation between the young men and women of Iraq’s different ethnicities. One of his most remarkable buildings was a futuristic mosque, shaped like a mushroom of a kind he might easily have seen wandering around his backyard in Lincoln. 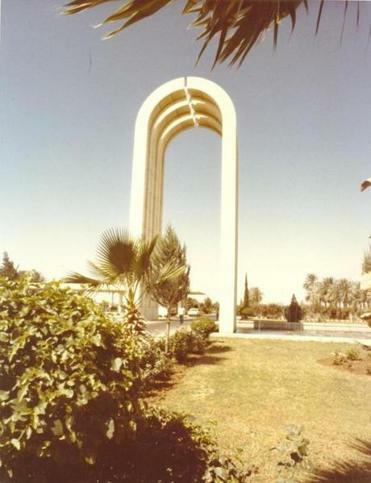 Finally, he gave a central placement to an archway called “The Open Mind,” a symbol of Iraq’s multi-ethnic, progressive future. 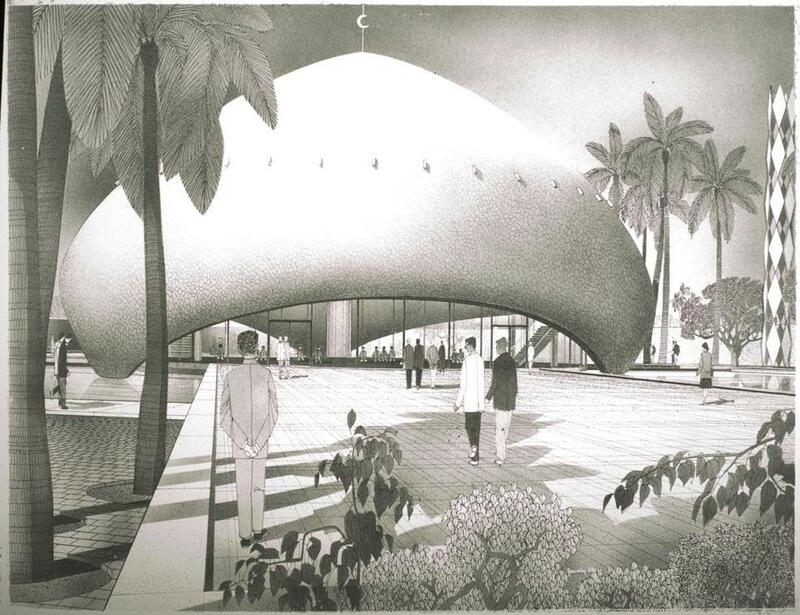 A rendering of a futuristic mushroom-shaped mosque. TO LOOK BACK on his plans today is to be stunned by the sweep of what the architects thought they could accomplish. Needless to say, Gropius was guilty of presumption and naivete, but it was a beautiful dream in an era when the Middle East felt new again, after the long hangover of colonialism, and ancient hatreds were, if not extinct, less corrosive than they feel today. King Faisal II proposed marriage to the daughter of the Shah of Iran, an alliance that might have reshaped the vexed Sunni-Shi’ite relationship, and he and his cousin, King Hussein of Jordan, allegedly contemplated merging their countries into one. Universitas soon received a setback. In 1963, TAC’s second patron, Qasim, was himself assassinated by disgruntled army officers and members of the rising Ba’ath party (which included a young Saddam Hussein). The Open Mind still stands, a monument to Iraq’s once glittering possibilities—or perhaps to the persistence of our illusions. The Middle East continues to attract the world’s most ambitious architects to make statements about the future—one thinks of the glassy skyscrapers of Dubai—but these are monuments to financial wizardry, and a long way from the idealism that a king and a prime minister once brought to the purpose of educating the young. At the moment, the overarching optimism that allowed Gropius to build anew over the rubble looks increasingly like a ruin from a distant age. Ted Widmer is assistant to the president for special projects at Brown University and senior research fellow with the New America Foundation. Poster advertising the 50 Years of Bauhaus Exhibition in Stuttgart, 1968. Günter Habermann Ich war in Stuttgart dabei. - Gropius war selber da! Beer stein, Cup and Saucer. Franz Ringer.